The more you know going into the home-buying process, the better. If you’re new to the home-buying process and getting ready to dive in for the first time, having the information you need is an imperative first step to success. 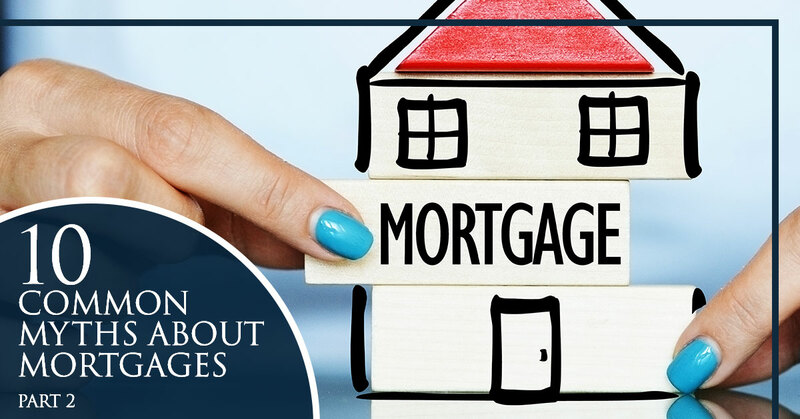 Unfortunately, when it comes to mortgages, there’s no shortage of myths and misinformation, and sometimes, the myths prevent people from getting pre-qualified for a home loan or even learning more about their options. That’s why, in our last blog, the experts at Patriot Home Mortgage touched on five of the most common myths about mortgages. Today, we’ll be going over five more. Myth #6. All mortgage brokers and lenders are made equal. Many people believe that it doesn’t matter which lender or mortgage company they work with because they all offer the same things and because all mortgage brokers and lenders are the same. However, this couldn’t be further from the truth. Mortgage companies, banks and lenders all offer different products and rates, and they all have different guidelines, too. Mortgage brokers and lenders are also very different. When you work with a mortgage lender, you are limited to one of the products offered by the lending institution they are apart of. But mortgage brokers are there to help you find the right loan for your needs from a variety of different lenders, and they’ll most likely be your contact person throughout the process, even though they won’t be providing the loan themselves. There are pros and cons to working with both mortgage brokers and lenders, but it’s important to realize that there are very big differences between the two. Myth #7. Your credit score is weighed just as heavily as your spouse’s. When you apply for a home loan jointly with your spouse, your lender will take both your credit score and your spouse’s credit score into account. And while both of these scores are used, they aren’t weighed exactly the same way. Lenders gather credit reports from Experian, Equifax and TransUnion — the three main credit reporting agencies. From there, they take the middle score from each agency, and they get rid of the highest one, which means that the lowest two scores are used to determine if you qualify for a mortgage and your mortgage interest rate. This means that the spouse with the lowest credit score will have a bigger impact on the interest rates and qualification than the spouse with the higher credit score. Myth #8. You can never qualify for a mortgage after filing for bankruptcy. There’s no doubt about it, qualifying for a home loan after you’ve filed for bankruptcy is difficult, and it’s certainly more challenging than qualifying for a home loan with a pristine credit score. However, this does not mean that you’ll never be able to secure another home loan in the future; it’ll just take more time and a few additional steps in order to do so. The first thing you’ll need to do so before applying for a mortgage after a bankruptcy is to get the bankruptcy discharged from your credit report. Then, you’ll need to start rebuilding your credit — the best way to do this is by utilizing installment loans and secured credit cards. You’ll need to wait two years to apply for a mortgage after a bankruptcy has been discharged from your credit report. You may qualify sooner than that, but you’ll likely have higher interest rates. Myth #9. You only need to worry about your monthly payment. When determining how much mortgage you can afford, it’s tempting to only think of the monthly payment, but the reality is that there are lots of additional costs that you should take into account. There are a number of initial costs that need to be considered, including the down payment, the closing costs, the appraisal fee, the inspection fee, the origination fee and more — all of which are due on or before the closing. There are a number of ongoing costs that need to be considered as well, including property taxes, homeowner’s insurance, private mortgage insurance (if you put less than 20 percent down) and the maintenance costs of the house. There are a lot of costs associated with homeownership, and it’s important to be aware of them before applying for a home loan. Myth #10. You can afford any loan amount you’re approved for. When you are pre-approved for a mortgage, your lender will tell you how much you’re approved for. However, just because your lender says that you can afford a $450,000 home doesn’t mean that you necessarily can. When a lender determines how much you’re qualified for, they look at your credit score and history, your debt-to-income ratio and how much cash you have on hand for the down payment. What they don’t consider is how much you pay for daycare every month or whether or not you’ll have enough to save for retirement or your child’s college tuition in the future. Lenders only look at whether or not you can afford to make the payments, not the effect that those payments have on your savings goals or other financial needs. That’s why it’s important to look at the big financial picture when determining how much mortgage you can afford, not just what your lender says you can afford. At Patriot Home Mortgage, we offer a variety of mortgage types, and we’re confident that we can help you find the right loan option for your needs and circumstances. Contact us today to get started!